NOTE: Some airports require an airport tax fee in cash. Please check with your departure airport if they charge airport tax fees. APC does not re-imburse airport tax. • Passport that is valid at least six months from date of entry to Egypt with two blank pages. • Copy of your electronic ticket. • Letter of invitation to AfriSIG, and if you are attending African IGF, please bring the invitation sent to you after you registered. • Medication for all your health needs. Egypt is not at risk of Yellow Fever but requires a certificate if you are coming from or have recently travelled to a country at risk of Yellow Fever. You must bring your Yellow Fever Vaccination Certificate or you will not be allowed to enter the country. We recommend that all participants obtain travel insurance for their trip. Kindly ensure that this insurance covers the date of departure from your country until the date of your return. Travel insurance will not be reimbursed. Upon arrival at Sharm El Sheikh airport, there will be someone at the arrivals with a board which has your name and the hotel name Maritim Jolie Ville Resort. If you have any problem locating your airport transfer, contact Kathleen Diga or Maritim Jollie Ville resort reception at +20 69 3600100. If there is a change in your flight schedule, please contact Kathleen immediately. Should you not meet up with the arranged airport transfer, you will be liable to pay your own airport transfer costs. Group transportation to the venue will be provided between Maritim Jolie Ville Resort and Hyatt Regency. Participants are expected to be in the lobby of Maritim Jolie Ville Resort at 08h00 every morning in order to take the bus together. • The bus will depart from Hyatt Regency to Maritim Jolie Ville Resort at 18h15 every every evening. Please note that if you miss this bus, you will need to arrange your own transportation to the venue and bear the cost yourself. The School starts at 9h00 ever morning. Please do note that AfrISIG is an intensive, but rewarding experience. Daily sessions will end around 18h00 but the groups working on the practicum topic will need to work in the evenings. Breakfast and dinner will be provided by the Maritim Jolie Ville Resort. Lunch and tea/coffee will be provided at the venue, Hyatt Regency, during the workshop days. As there is night time work every evening as part of the practicum it is easier for you to have dinner at the hotel. We will however arrange a group dinner elsewhere on 1 December. International and local telephone calls, laundry, use of the mini bar and all other personal expenses such as additional drinks and meals MUST be paid by the individual who ordered them before you check out of the hotel. We will not cover these costs. If you have any dietary and special requirements needs, make sure it is brought to the attention of the logistics team before you travel. Wireless connectivity is available at the Maritim Jolie Ville resort and the Hyatt Regency. The power supply voltage in Egypt is 220V, frequency ~50Hz. 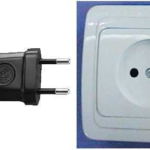 Most electrical outlets are as shown below. Please bring your own adaptor. The official currency of Egypt is the Egyptian Pound. The current rate of exchange of the Egyptian pound is approximately 17.60 : 1 USD. Banks are open from Sunday to Thursday, from 8.30 a.m. to 2 p.m. Credit cards, Visa, American Express, Access/MasterCard can be used. Money can be exchanged at the airport on arrival and all major banks. Participants should take some basic precautions to ensure your safety and the security of your valuables. Please keep your hotel room locked, and store your valuable in the hotel safety deposit box.